Having got all those bits to the right sort of shape, I was faced with the problem of colour. No spray booth, no compressor and limited funds. I’d read a few different stories on the net of people successfully painting cars with Rust-Oleum. For the uninitiated, Rust-Oleum is pretty much an old fashioned, oil based, domestic gloss paint. Thinking back to days of carriage painting, it was all done with a very soft brush, lots and lots of coats and lots of rubbing down, starting with fairly fine abrasives and working down to pads lovingly made from the fur of baby squirrels dampened with virgins tears. SPOILER ALERT !!! I’m tempted not to point this out, both for the sake of the story and to catch out those who don’t read to the end of a set of instructions before following them, but that would be cruel. The paint job was not a success, but I now know why! Step one was to rub the tank down. Always use a sanding block, even on curved surfaces, and always use wet and dry wet, or it will clog instantly. I think I rubbed the original paint down with 400 grit to provide a good key for the new paint. I then applied a couple of coats of Rust-Oleum primer, thinned with white spirit until it took four seconds to drip off a teaspoon. 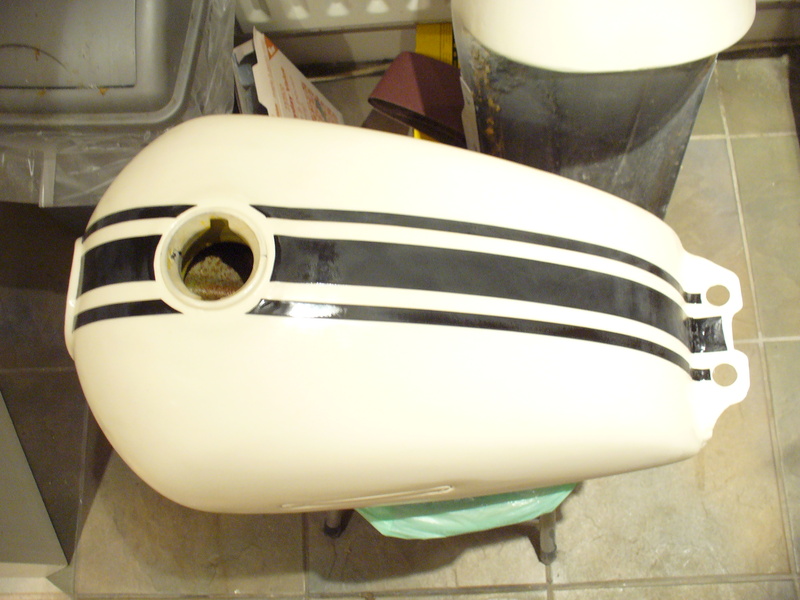 It takes remarkably little paint to cover a small fuel tank, so don’t mix a huge batch up. After a couple of coats of primer it was sanded down with 600 grit and then 800 grit to give a good, flat finish. I sanded through the primer several times and had to re-coat it, so unless the finish is really bad I’d recommend no more than a quick scuff over. The next coats settled into a routine for a while. Home from work, rub it down with 600 grit, dry it off, apply a coat of paint and then dinner. At first it seemed to go swimmingly, until I managed to sand through the finish. No problem, just a quick coat of primer again, sand it off then back to the top coat. Well, the quick coat of primer was fine, a quick coat of colour was fine, then the next coat might as well have been paint stripper. The whole area just bubbled up in a complete mess. Removing it left what can only be described as a hole, about an inch long and three quarters wide. With hindsight, I reckon that I overcoated it too soon. There is a point where it is just dry enough to cover, but not so dry as to require sanding. Too early and the solvent dissolves the layers underneath. This was definitely too big a hole to fill with paint and body filler would be the wrong colour and take a million coats to hide. What I needed was a filler the same colour as the paint. This is where my memory went back to toy aeroplanes. There was a product available called micro-balloons and that’s just what it was. It looked like a fine powder, but was hollow, so you could mix it with glue or paint to make a really light filler. Of course a few grams wasn’t going to matter on the tank, but a fine finish in the right colour did. Micro balloons were somewhat expensive and I had no idea where to find them so an alternative had to be found. The answer came from the bathroom and was Johnsons baby powder. Mix it with paint and one instantly has a very fine filler in the exact colour that you want it. That idea was definitely a success. So, from there I continued along the same lines, made the same mistake twice more and finally had a very flat, very smooth paint job. I took that down with 1200 grit and was really quite chuffed. Three vinyl stripes gave me the colour scheme I was after and then it was time for the clear coat. I decided that clear coat would probably work best sprayed, so I elected to use a rattle can of the same brand. Once more It went on fine, once more I sanded through it, once more the repair bubbled up like something out of a low budget sci-fi movie and left me with a huge repair job. Once more, I repaired it. Finally I got it down to 1200 grit, rubbing compound and a good coat of wax. I reckoned it looked pretty good. The seat proved a bit simpler, except that there was a big hole in the hump to fill up and it was full of pinholes because it was originally vinyl covered. The former was a simple matter of ally mesh and filler and the latter, back to the baby powder. The side panels were just as simple, but I didn’t seem to be able to get quite the same standard of finish. Maybe I was just a bit lazy by then. I also decided to paint the engine. I was originally going to polish the engine casings, but my early attempts were not encouraging. Essentially, the alloy used in Japanese bikes is a whole lot harder than that used on the old British ones (presumably to cater for thin walled vacuum cast casings) and develops over the years that strange mottled grey look. That surface oxide layer is very thick, so we’re talking about using something like 220 grit to move it. 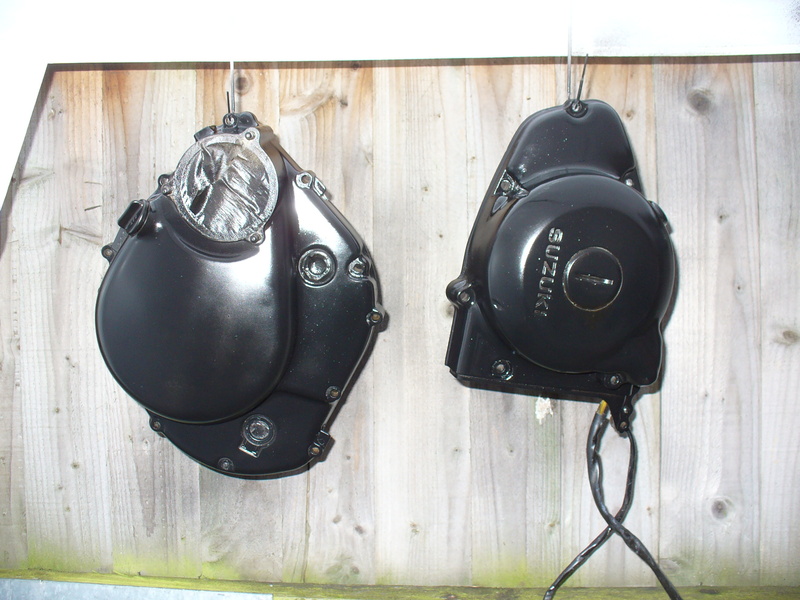 It simply wasn’t practical in the timescale, so a coat of black paint from a rattle can was the way to go. All that went fairly well until I refitted the tank, after some minor tweak, forgot to reconnect the fuel pipe and turned the tap. By the time I noticed, it had removed a large quantity of paint from both the engine and one side panel. It’s pretty well known that very little short of two pack paint will be fuel proof and, being pretty new, it didn’t stand a chance. I made up some vinyl decals for the side panels. I got the inkjet printable vinyl from Ebay and can’t say that I was impressed. The black came out quite light and a bit blue tinged and then dissolved instantly when I blew clearcoat over it. Once I had it all sorted and reasonable again it seemed to be fine for a while. After a couple of thousand winter miles, however, the paint on the tank began to crack and now looks like a dried out dessert landscape. The most likely reason is that I got carried away and put too much paint on. That causes a lack of flexibility in the paint and cracks soon appear. Another possibility could be that I didn’t leave enough flash time between coats, but I did follow the manufacturer’s instructions, so that seems less likely. Yet another possibility is that I went straight from painting to finishing. You’re supposed to wait about a month after painting before cutting and polishing the paint. I didn’t. I guess the conclusion is that the Rust-Oleum route can work, but I didn’t get it right. I’m certainly convinced that a good finish can be produced with a brush and some patience. I’m now the proud owner of a compressor (Aldi – £90) and a “new” tank, but before that job goes forward I’ve got to sort out the dent in the tank and make an air cooler/drier for the compressor. More on that considerably later. This entry was posted in Uncategorized on May 27, 2014 by thebackyardbuilder.